Establishing themselves in France Shakin Street was signed to the french chapter of Columbia Records in 1978 releasing their first LP Vampire Rock the following year seeing guitarist Armik Tigrane leave the band in favour of arrival of producers Sandy Pearlman and Murray Krugman fresh from the three LPs they made with The Dictators, at this point working with The Clash on their second LP Give Them Enough Rope. Ross The Boss from The Dictators was added to the group together with original member guitarist/composer Eric Levy to form the dual guitarattack, an axis between Paris, N.Y. and L.A. was established, and Shakin Street signed with CBS International for release of their second LP Solid As A Rock before embarking on touring in Europe and the US, the band seeing its demise shortly after Ross leaving the band in 1981 to join up with sword and socery conceited outfit Manowar. 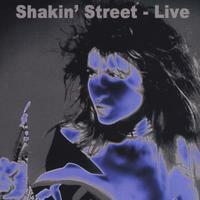 Shakin Street Live was recorded at a concert in 1980 during this touring and includes in addition to some not previously released songs in the liveset also bonus studiotracks of those. For any fan of Shakin Street this CD is a real treat, for anybody not aquainted with the band a place as good as any to start with if you wanna let's say 'get a little groovier' and 'get down with the delicate dynamics of Shakin Street'. Presenting a different setlist than the one that appeared on the 1989 semi-bootleg Live And Raw, having an equal mix between the unreleased material and songs from both the Shakin Street albums, Shakin Street Live seems also somehow superior to Live And Raw by being a better sonical representation, the atmosphere of the concert/audience representation cooler than on Live And Raw, the performance more punkrocking than Live And Raw's more heavysounding outing. Starting out with What Kind of Love one of the unreleased songs it's a dancefloor-killer showcasing all Shakin Street's Ramones-status promise and from there on there really is no stopping. It rocks like Rolling Stones should be ashamed could they have done it any better! Shakin Street is the real deal! During another of the unreleased songs the great Scarlet there is a pleasant intermezzo with the audience participating in chorus-backing for the band. Then the heat is put on with Every Man and Every Woman is a Star followed by a spellbinding version of Box You before the air is shattered by Fabienne's harp-intro for Blues is the Same the song growing and growing untill the group reaches a cool crescendo showcasing the interplay between Eric's and Ross' guitars. A few more songs till we reaches the most pleasant surprise of the concert-recording the unreleased I'm Your Girl, another killer again showcasing Eric's and Ross'and the rest of the band's assault, before ending the show with a cool version of No Compromise and we are once again reminded why we found bands like BÿC, The Dictators and The Ramones so good at handling those serious existential themes. Well... it's a killer live-recording but no less is hearing the studio versions following. The three unreleased tracks presented are simply stunning in their studio versions. The intro to I'm Your Girl sums up The Hellacopters in a moment. Scarlet comes across a real dirty rocker but listen to the vocals! Then: What Kind of Love in all its danceflooryness.... Wrapping up the CD is a track again reminding you of The Ramones which has previously appeared with vocals in french on a couple of bootlegs under the title Momes des Villes, here sung in english and entitled Heavy Metal Kid! I love this band but........this is too expensive .That's really too bad as i really would like to buy it after listening to it . Reasonable quality live recording bringing back the atmosphere and memories of 1980. Shakin Street deserved to grow far bigger than they ever did. Luckily we have this tresor..
GREAT LIVE DOCUMENT; SOUND QUALITY IS NOT PERFECT, BUT WHO CARES? at a time when travelling to work in London by tube is a slightly tense affair, this is necessary ipod fare - the sort of live album which not only kicks bottom but makes you want to rob a bank, or at least, sneer slightly at fellow travellers. This band's cool. This CD show, that they could pull it of live. Great performance and; YEAH, Ross the Boss rules...this man knows how to play... as always..
Great stuff. Very raw sounding recording which I actually liked. Too much polish on live music like this does not work in my opinion. Studio stuff was great too. Well worth the purchase. If you were like me quite taken with the wall of sound production of the final Shakin' Street LP "Solid as a Rock" then "Live" will more than fulfill your need for more of the same. Here's your chance to hear the band live and they don't disappoint with a superb mix of unadulterated guitar riffs and Fabienne's accented vocals on top. She really doesn't sound like anybody else. If you like pure guitar riffing without the rest of the band having to have their say at the same time all the time then you really can't go wrong here. In fact that's it's unique quality setting the band apart from it's peers in the heavy rock pantheon. Take a listen to "No Compromise" and you'll see what I mean!